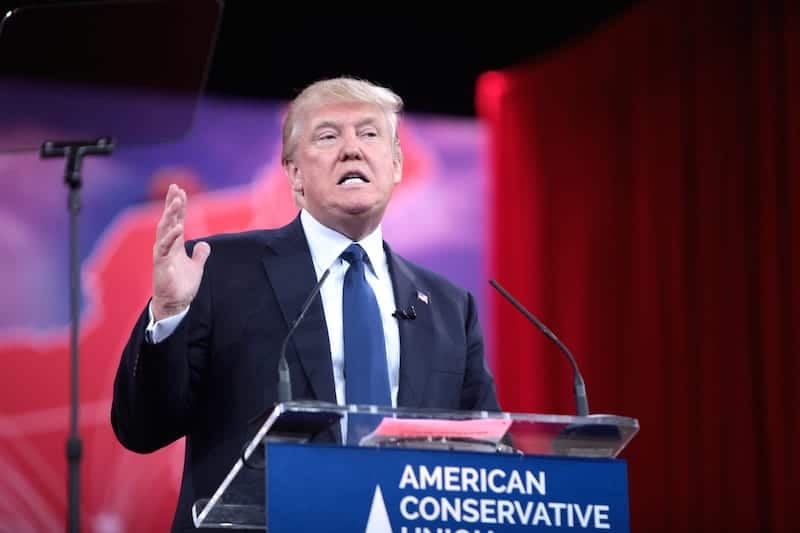 Whilst Support for Donald Trump grows, with the frontrunner of the Republican candidate race hotly tipped to win the Super Tuesday primaries in Texas and other states, do US voters care about the lies? Pulitzer prize winning political fact checking website Politifact shows 1% of Donald Trump‘s verifiable claims are true, whilst a whopping 78% are classed as false, mostly false or ‘pants on fire’. 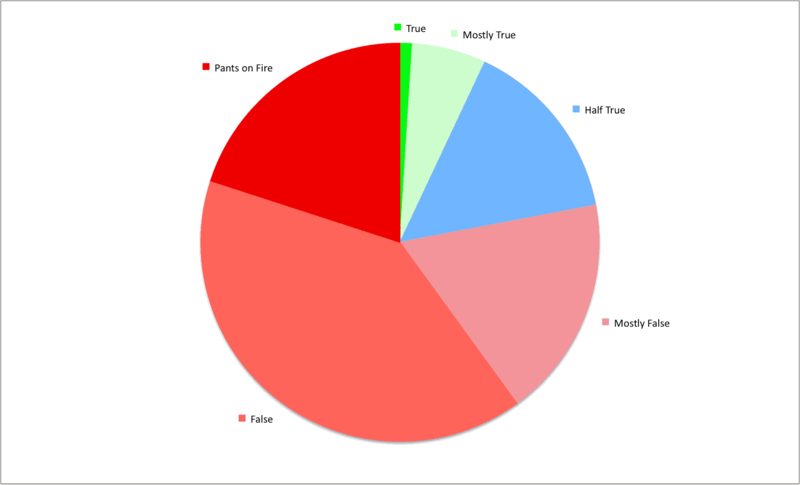 As you can see from the yummy liar pie below, an astonishing 78% of Trump’s verifiable claims, facts and statistics are either false, mostly false, or so ridiculous that PolitiFact labels them as ‘Pants on fire’. Incredibly, Donald Trump seems to be able to pedal the most bizarre statements and lies, often whatever pops into his head at that moment, and the support for him blossoms. Supporters claim he is straight-talking, unscripted and refreshing even though his discredited facts and contradictions are well publicised. Despite being continually discredited and winning the PolitiFact Lie of the Year award 2015, Trump continues to shrug off the truth and pedal the lies whilst his support grows. True 1% (The statement is accurate and there’s nothing significant missing). Mostly True 6% (The statement is accurate but needs clarification or additional information). Half True 15% (The statement is partially accurate but leaves out important details or takes things out of context). Mostly False 18% (The statement contains an element of truth but ignores critical facts that would give a different impression). False 40% (The statement is not accurate). Pants on Fire 20% (The statement is not accurate and makes a ridiculous claim). 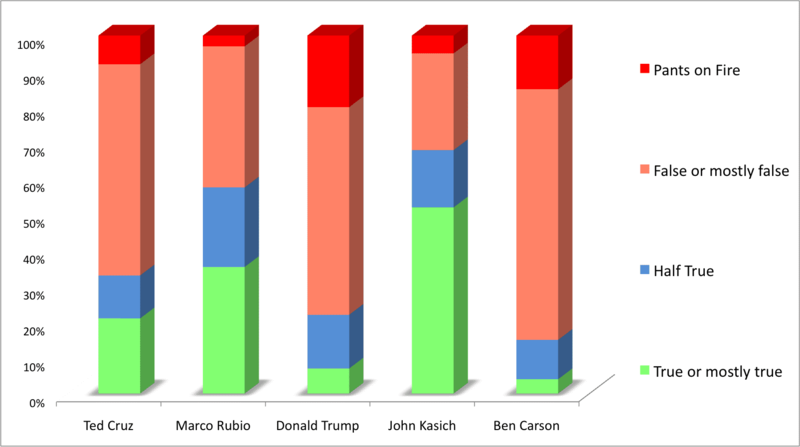 To our surprise Trump isn’t actually the biggest liar in the Republican candidate race. Ben Carson delivered an even more astonishing zero percent true statements with only 4% of his stats or facts being ‘mostly true’. Although Trump does still spew out more outrageous lies labeled as ‘pants on fire’. If Republican voters were looking for the candidate with displaying the most truth and integrity on this measure, John Kasich would appear to be the most truthful with 52% of statements, facts and stats showing up as true or mostly true. Hardly inspiring, but the best of the bunch. So, what will happen in the Super Tuesday primaries? Will the US tell the world that they don’t really care about truth and integrity, or will the Republican voters finally wake up and smell the nonsense that is being spouted to them? A little bit about our source: PolitiFact is a fact-checking website that rates the accuracy of claims by elected officials and others who speak up in American politics. PolitiFact is run by editors and reporters from the Tampa Bay Times, an independent newspaper in Florida, as is PunditFact, a site devoted to fact-checking pundits. The PolitiFact state sites are run by news organizations that have partnered with the Times.